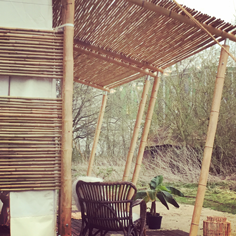 Do you want to buy a luxury bamboo eco glamping tent? Mocadazu is the leading brand in luxury bamboo spa & resort tents, glamping tents and pavilions. Our bamboo eco resort tents are unique, of the highest quality, super luxurious and eco-friendly. The exotic look of each glamping tent instantly creates a vacation mood for you and your guests. 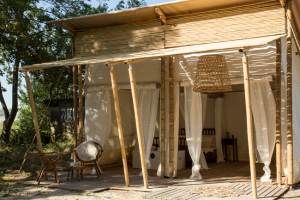 Mocadazu’s luxury bamboo eco resort tents are all made with a frame of world’s strongest, treated bamboo and finished with high quality textiles. 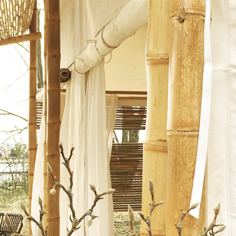 If you want to buy a luxury bamboo eco glamping tent, Mocadazu is the right place for you. The Mocadazu Resort series are our top notch luxury bamboo tents, especially designed for resorts and luxury hotels. The difference is in the detailing. The Mocadazu Resort series has a larger covered outside area, reinforcement in the roof for extra stability, more use of esthetical bamboo and romantic lace curtains. The roofs of the Mocadazu Resort tents are standard of an opaque and fire resistance PVC fabric. The luxury bamboo eco resort tents have a long lifespan, are very easy to clean and can remain up all year round. 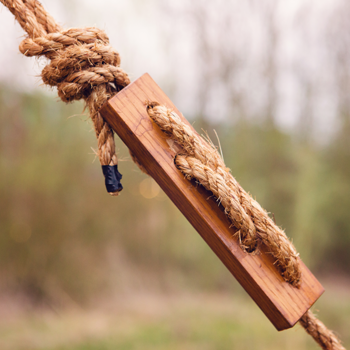 All our eco glamping tents are handmade with care for people and nature. 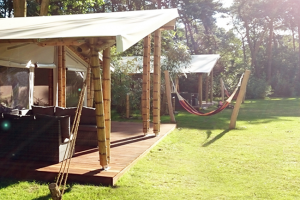 Mocadazu offers a variety of beautiful bamboo spa & resort tents, glamping tents and pavilions. 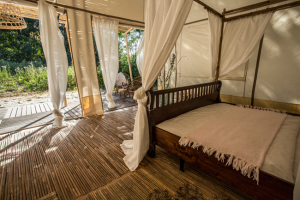 Whether you own a luxury resort, a beautiful campsite, a bed & breakfast or a nature reserve, Mocadazu provides you with the perfect bamboo eco glamping accommodation for an ultimate dream vacation. Or choose one of our stunning bamboo pavilions. They can be used for a wide variety of applications, such as a covered terrace, a lounge or an exclusive cover for your event. The Mocadazu Spa & Resort tents are our top notch luxury bamboo eco resort tents, especially designed for high end resorts and five star luxury hotels. Instead of being tucked away behind concrete walls, where all connection with nature has been evaded, our luxury Spa & Resort tents bring the luxury lifestyle back to the heart of nature. 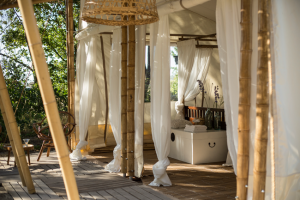 The bamboo eco Spa & Resort tents are characterised by their high-quality finishing and detailing. 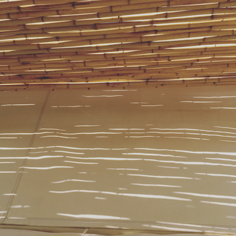 Our luxury bamboo pavilions and shades provide a pleasant climate outdoors. They allow you and your guests to enjoy the beauty of nature while being protected from the heat of the sun or from rain. The bamboo pavilions and shades can be used for a wide variety of applications, such as a dining area, shaded hammock or lounge area. 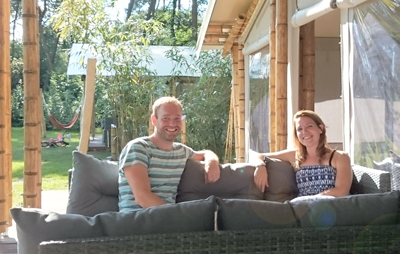 Why choose a Mocadazu Luxury Bamboo Resort Tent? Bamboo is beautiful, strong, lightweight and sustainable. By using bamboo for the frames we literally bring nature inside! The species we use is Guadua bamboo from South America, which is known as the strongest bamboo in the world. It is perfectly suitable for constructions. The bamboo is pre-treated against insects and varnished to protect it from the elements. There are no tents like Mocadazu’s luxury bamboo eco resort tents. Both the design and the use of bamboo for the frames makes our tents unique in the world. With their exotic appearance the eco glamping tents will instantly create a vacation mood for you and your guests. Comfort and luxury should go hand in hand with being eco-sensitive. That’s why we designed our luxury bamboo eco resort tents to have the lowest possible impact on the environment according to the ‘Cradle to Cradle’ principle. The use of bamboo highly reduces the greenhouse effect and climate change. It can grow exceptionally quickly without the need for fertilizer, pesticides or much water. Bamboo absorbs up to five times more carbon dioxide and releases 35% more oxygen into the atmosphere than an equivalent type of hardwood. The textiles for the roofs are 100% recyclable according to the Texyloop system. The semi-permanent character of our luxury bamboo eco resort tents opens doors to the most beautiful and exclusive destinations in the world. The large openings and windows in our luxury bamboo tents allow guests to optimally enjoy the beautiful surroundings. From remote beaches to deep in the jungle, floating on water or high above the ground on a platform; our bamboo tents are the perfect luxury hide-out at the heart of nature. We use the highest quality materials available because we believe that only the best will do. Our luxury bamboo eco resort tents are durable, weather resistant and have a long life span. They are can remain up all year round. The textiles we use in our luxury bamboo eco resort tents have a long life span, do not discolor or sag and are very easy to clean. They are waterproof, UV resistant and mildew resistant. The textiles for the roofs consist of a polyester yarn that is coated with a waterproof PVC layer. Our inner tents are made of a top quality canvas fabric of TenCate. The textiles are also available with a fireproof coating. Mocadazu was established in 2013 by Bouwe Besseling and Anna Raetsen, two young, idealistic and innovative designers. We are convinced that comfort and luxury can go hand in hand with being eco-sensitive. That’s why we designed our luxury bamboo eco resort tents and pavilions to have the lowest possible impact on the environment. It is our dream to increase sustainability within luxury accommodation and pavilions, because we believe that nature is so beautiful and vital that it should be protected. “Hi! I’m an Architect. My passion is to address complex design challenges and turn them into logical, user friendly and most of all, beautiful designs. As an architect I find the dialogue between the environment and the design intriguing. “Hello! I’m an Industrial Designer. I am passionate about designing products that are eco-friendly, without compromising one bit on aesthetics, comfort and luxury. For me the most important starting point when designing is user experience.